(GC) Glass Composite Glass Layup, PVC reinforced deck, croc skin EVA deck pad, cargo net, U.S. standard box / 12K carbon Weedless fin, Gore-Tex breather valve, EZ-Grab handle, multiple leash attachment options. The F 12.0 is the new younger sibling in the F Series of boards. It’s built on the same premise of stability, glide and fun. The 12.0 is perfect for the female or smaller male paddler, but its generous volume makes it accessible to a wide range of paddlers and abilities especially where variable conditions of water exist such as open ocean or downwinding. Rail-to-rail stability means enhanced glide with reduced effort. You just may find yourself smoking your friends on flat water too! 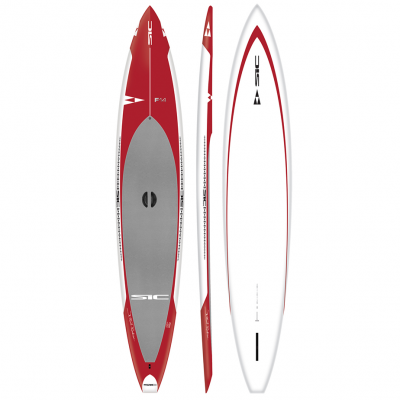 The F Series range of boards has garnered huge appreciation for its Bullet like performance characteristics with its planing hull design, bringing these benefits to a wider range of paddler abilities. Not everyone has predictable trade winds and swell that lines up like corduroy. In fact, many people are paddling in lakes and harbors where just dealing with boat chop can be frustrating and challenging to stay on your board. Having designed and tested board shapes, rockers, widths, and volumes in the most challenging conditions in the world, Raaphorst came up with the perfect prescription for the board that can handle the widest variety of conditions and paddlers. 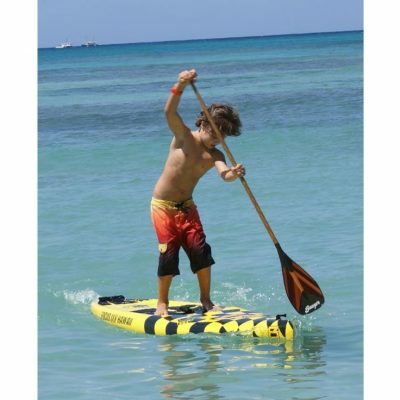 This board has been tested extensively by Jeremy Riggs who is not only one of the most accomplished open-ocean paddlers, but also one of the most sought-after paddle coaches for open-ocean and downwind paddling. The F Series boards let people focus on fundamentals because they are not worrying about falling off the board. The performance of this board remains at a high level and will give a novice paddler room to grow into a recreational expert. The F Series offers all the same design benefits of the Bullet Series, like a flat bottom (planing hull) for smooth-gliding performance. Wider mid and tail width, higher overall volume and full rails make the F Series the most stable planing hull design in the SIC range. The rocker line is based on the Bullet v2 rockers, which means nice glide and early planing. While the F Series handles 20+ knots downwind runs nicely, it excels in sub 20 knots. For 2018 the F 14.0 will come in SCC+ (Single Carbon Composite + InnegraTM) construction, while the F 11.0 and F 12.0 will continue to be offered in SIC GC (Glass Composite) construction for the best strength, weight, durability, value, and ratio. The boards come complete with EZ-Grab handle, 12K carbon Weedless fin as well as leash plugs and bungee tie downs.